Although the “Just Say No!” slogan may have backfired a bit on the Reagan administration, you may need to be more selective about the device you choose to smoke with in light of factual information (versus alternative facts) about the biggest cash crop in America. If cannabis is treated with pesticides, is it helping or harming; curing cancer or causing it? From 1850 to 1936, cannabis was used as the primary medicine for more than 100 separate illnesses. For a weed that has been traced back to 3000 B.C. in Siberia, used medicinally in China for thousands of years, and deeply rooted in American history, consumers are left wondering whether their benign green friend is so benign. Commercial marijuana is mass-produced at factory farms. Marijuana sold in retail stores is grown with low-cost synthetic fertilizers and over 250 approved pesticides. Sadly, where there’s potential wealth greed isn’t far behind. This new era of poisoned pot bodes ill for people with impaired immune systems, a health risk that is greatly multiplied in cannabis concentrates. With the recent multi-state recalls of tainted recreational marijuana, even healthy casual users should be concerned. Gone are the days of long-haired hippies lovingly tending small patches of illicit crops. According to Bloomberg Markets, the legal cannabis industry in the U.S. is projected to grow to $50 billion in the next decade, more than eight times its current size and blowing rings around the current contenders: corn and wheat. Victor started Scientific Inhalations in 2009 so he could continue to craft high-end paraphernalia from scientific-quality glass rather than having to work around the markedly inferior and defect-prone Chinese artistic glass. A guy named McFinn approached him about engineering an adaptation for a pipe for a customer who had cancer and couldn’t move his hands well. “Necessity is the mother of invention” and the McFinn’s Original Triple-Filtered Glass Bubbler was born. At the time, Victor didn’t realize that his filtration process had also created a healthier device for smoking medicine. He began to hear feedback about how the four-stage filtration was providing a smoother, cleaner hit. Folks who had chronic coughs or cancer of the throat reported that it helped them. Those user reviews encouraged his love for the craft. “When you hear of someone who has to smoke for medical reasons and it’s better and cleaner, you know you’re doing something good for the process,” said Victor. As he learned more about challenges in the medical industry, he was inspired to get one step ahead of the pesticide issue and test what his filtration system could really do. Dr. Raber had become a medical cannabis patient for his own ailments and quickly recognized a tremendous need for quality control and assurance in the burgeoning medical cannabis arena. He developed an analytical testing laboratory with the belief that medical cannabis should be as consistent as aspirin. Unfortunately, it’s the Wild West in the industry right now. 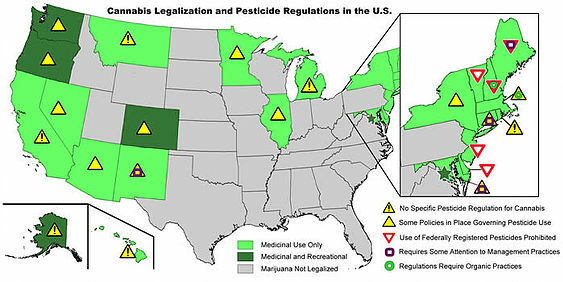 Marijuana is unique in that it’s still federally illegal so no federal regulations or pesticide laws apply. States with legalized marijuana who wanted to regulate pesticides had to come up with their own standards of tolerance levels. Tolerance levels are limits on the amount of a pesticide that can be detected in a product and still be safe for human consumption. States like Nevada, Oregon, and Washington have strict limits on how much pesticide residue is allowed on marijuana that’s sold and require testing before they go on sale. Feel better? Well, lab testing isn’t standardized either. Point fingers in whatever direction you’d like from the government, to state regulators, on down to greedy growers; but Dr. Raber had a mass spectrometer and knew what he had to do. In general, Dr. Raber and his peers discovered that the portion of pesticide recovery is alarmingly high and is a serious concern. 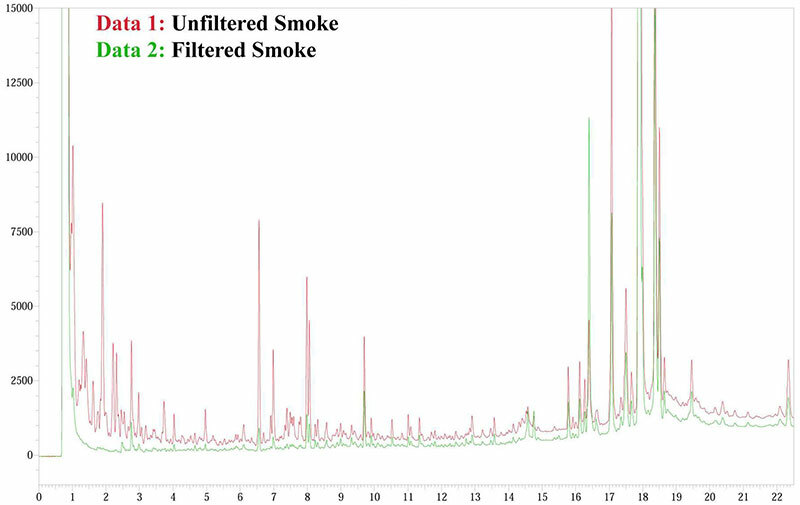 This discovery led Dr. Raber to replicate the testing and co-author a peer-reviewed study of pesticide residues in cannabis smoke in the Journal of Toxicology which validated his testing and Scientific Inhalation’s filtration claims. Here’s a breakdown of the important filtration characteristics. 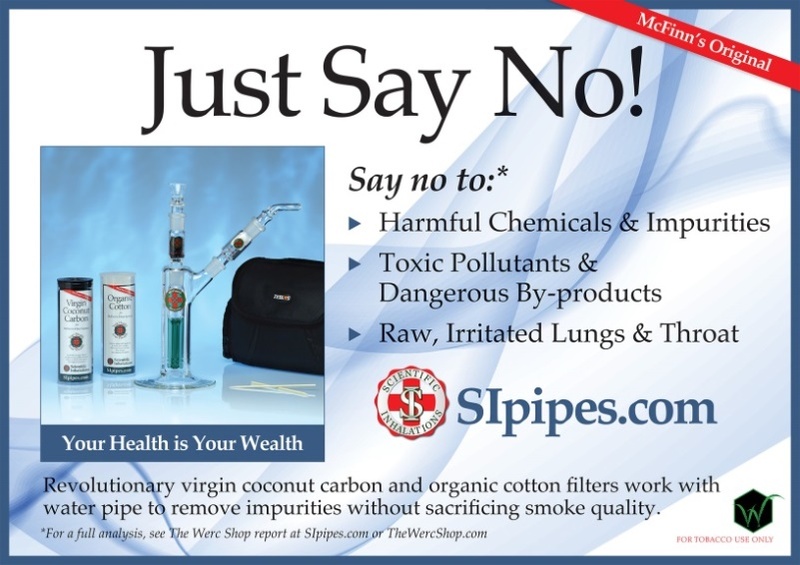 Step 1: Inhaled smoke passes through 100% virgin activated coconut carbon which is widely used across many applications as it is known to effectively trap and reduce or eliminate tar and other carcinogens. Step 2: The inhalation passes through a down-stem perc which cools and diffuses the smoke into tiny bubbles. Step 3: The diffused smoke bubbles enter the water chamber to be cooled and stripped of additional impurities. Step 4: Finally, the inhalation passes through certified 100% organic cotton to remove further impurities. There are 250 legal pesticide sprays on the market. 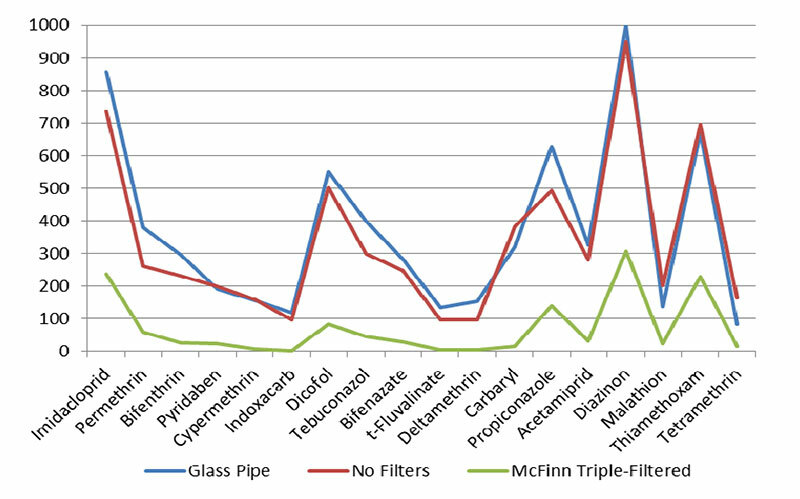 Of the 17 over-the-counter garden sprays tested in the study, 75 to 100% of the killing agents were trapped by McFinn’s Original Triple-Filtered Glass Bubbler. In addition to the removal of pesticides, the McFinn’s Original Triple-Filtered Glass Bubbler also removes multiple potentially harmful components from the medical cannabis smoke vapor including two chemicals identified as pyrocatechol and naphthalene. As The Werc Shop reports prove, an impressive list of pesticides and harmful chemicals are successfully removed during this four-step filtration process and Scientific Inhalations is able to make claims that their pipes provide a cleaner and healthier way to smoke. Dr. Raber emphasized the importance of each step in condensing the smoke and creating more of an affinity for the organic cotton’s ability to trap chemicals. The end result is certainly not devoid of chemicals, but there is a smaller risk of exposure.